When evaluating domain names for purchase, one of my tactics involves a search of the top-level domains. The tactic being this: if more extensions are taken for a given second-level domain, there are likely to be more opportunities for businesses to upgrade to this domain name. In addition, popularity of the second-level domain may indicate that more companies will startup over the next few years and may have an interest in buying this domain name. Go to ZFBot.com, create and sign into your free account. Type “react” into the “Starts with…” input field, click the “Length” button to lock it to five characters and click the “Search” button. I see 111 top-level domains registered with “react” as the second-level domain. These include everything from react.academy to react.xyz, including react.com, react.biz and react.info. React is a popular second-level domain name. Contrast “react” to “underwaterwatch”. Only the .com is registered, which indicates that there are less companies interested in launching on a domain name like this. I was recently in a Namejet auction for the domain name mentioned.com. I liked the domain, but didn’t love it because of it being a past tense word, a topic I teach about in DNAcademy how past, present and future tense affect valuation. Still, other valuation metrics of the domain name appealed to me so I bid on the domain name in auction. Looking up the word “mentioned” on ZFBot.com revealed eight top-level domain names registered. But if I turn off the exact match search, I can see the potential pool of acquiring companies grows to 31 and includes domains like mentionedapp.com, mentionedhere.com and mentionedonair.com. One. More does not always equal better. If I search for “iphone,” I see 160 exact match and 10,000 broad match results. Registering domain names with a dominant trademark is always a bad idea. In this case, you can look through the nameservers and see that apple.com shows up over and over again. Two. A tool does not replace an investor’s common sense. This tactic and the ZFBot tool is only meant to gather data quickly. You, then, need to ask yourself why the data is what it is. Maybe one company owns all of the registrations. Maybe no one finds value in this second-level domain. Maybe you’ve hit on a trend before it’s well known. Apply your common sense. Three. The ZFBot.com tool does not include ccTLDs, or country code top-level domains. It only includes generic top-level domains. So there may be additional opportunity for businesses using ccTLDs like .co, .io, .co.uk or .se to be interested in upgrading to your domain name. Four. I don’t have any insight on how often data is refreshed on ZFBot.com. 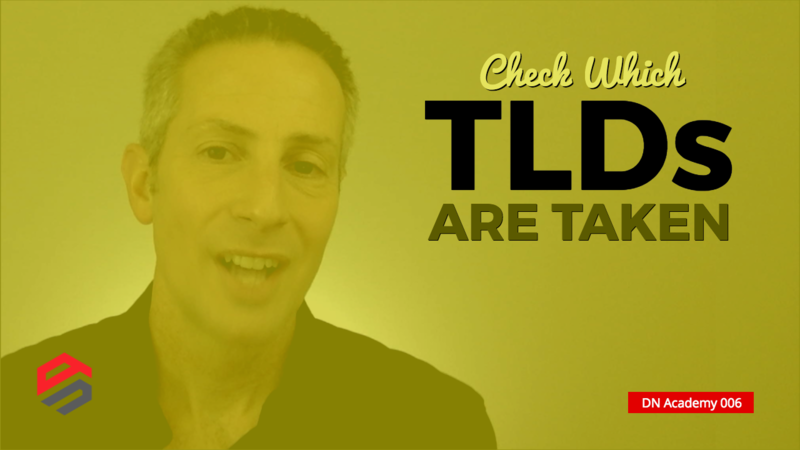 If you think you’ve found a better tool for listing registered TLDs, please post it in the comments. Five. In DNAcademy I define the differences between generic keyword, exact-match keyword, brandable, acronym, numeric and alphanumeric second-level domains. This investing tactic may not apply to invented brandables. And finally, this is just one of 18 valuation metrics that are taught in DNAcademy. It’s not the end-all be all metric, but it is one that can help you find the exceptional domain names with hidden, future potential. Hi Michael, hope the Academy is going well. ZFBOT was one I overlooked for a long time, I found it supplemented Estibot’s Lead Generator quite well. I was hoping to meet you at NamesCon this year, but it’s all been a bit last minute and I had to prioritise. So hopefully next time, great vid thanks. Bummer I won’t see you in person at NamesCon, Howie. I hope next year. To the point, succinct and jam packed with useful info. Nice post! Thanks for watching and taking a moment to post a comment, Keith. I appreciate it. DomainPunch is what I am using. Not sure it is better than ZFBot but little on the same plane. Great tip, Vishal. I’ll need to try DomainPunch. Always such good information especially for a newbie to the Domain Business. Looking forward to meeting you Michael face to face at NamesCon this coming week. Thank you for a great intro and education to the business. Looking forward to meeting you as well. I’ll be in the networking lane all day Sunday. Come by and say hi!